When the past intersects with the future . . .
As Brenna relies on her P.I. skills to find her daughter before it's too late, evidence surfaces showing a possible link between Maya's disappearance and Clea's. But could a case from three decades ago really be connected to her daughter? Or is someone hoping that Brenna will play along in a twisted game—one that there's no chance of winning . . . or surviving? 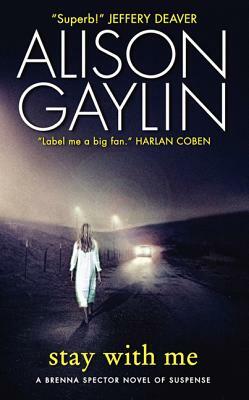 Alison Gaylin is the award-winning author of Hide Your Eyes and its sequel, You Kill Me; the standalones Trashed and Heartless; and the Brenna Spector series: And She Was, Into the Dark, and Stay with Me. A graduate of Northwestern University and of Columbia University’s Graduate School of Journalism, she lives with her husband and daughter in Woodstock, New York.